For this example the prototype area is used to wire a Honeywell SS345PT hall-effect sensor to ATmega328 pin PB1 (Arduino pin 9). The SS345PT has a TTL output (internal pull-up) and can be powered with voltages from 2.7 to 7V. 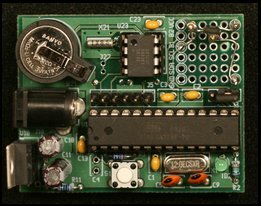 Since the PICO1TRC typically runs at either 3.3V or 5V no additional components are required to use the SS345PT. To wire the SS345PT I used Vector K24A pins. 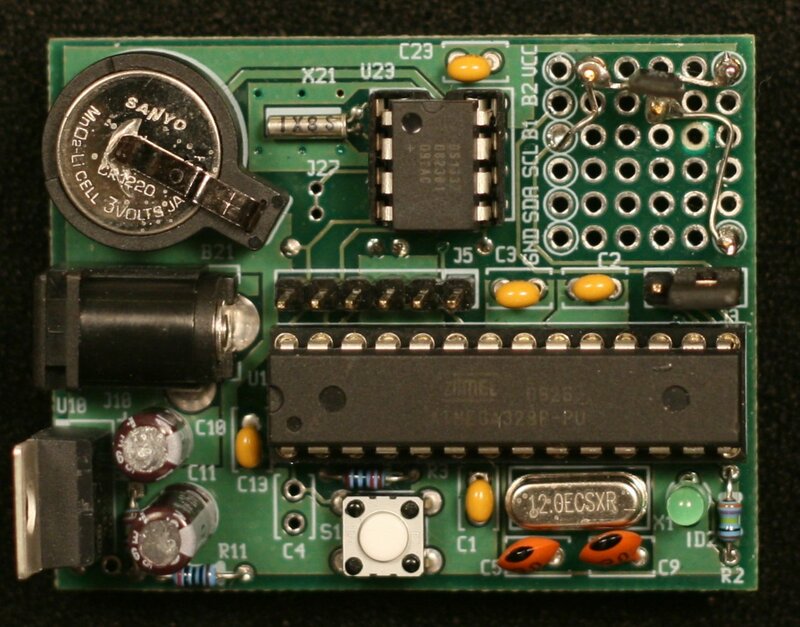 Each lead of the SS345PT are soldered to a pin and a jumper wire connects from each pin to the interface row of the prototype area. The sketch uses an interrupt routine to track the state of the SS345PT output. When a magnetic field of sufficent strength and oriented in the proper direction passes through the SS345PT the output state changes from high to low. The interrupt routine is called whenever the PB1 pin changes state. When the interrupt routine is called a flag, alarm_flag is set and the output state of the SS345PT is saved. The inner loop of the program reads the RTC registers every second. The loop exits if a magnetic field was detected or if the seconds count is zero. When the loop exits the time is printed. If there was a change in the magnetic field then a message is printed. 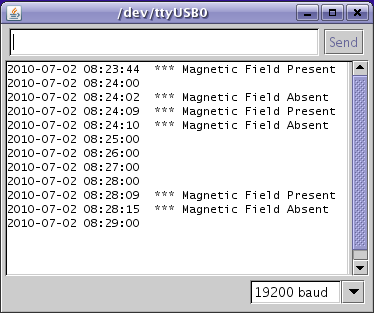 The screenshot on the right shows a sample run from the program. // There are three pin change interrupt (PCI) lines. // pin that is connected to hall effect sensor. // state of the magnetic field is read into mag_field_p. // The interrupt flags are read and reset in the main loop.